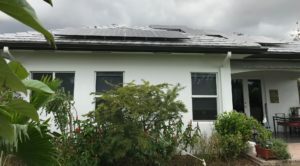 Elisabeth Murray’s solar panels withstood Hurricane Irma’s winds and rain. The damage caused by Hurricane Irma impacted every part of the state. The storm’s high winds and heavy rains are forecast to cost tens of billions of dollars to repair. As we work to rebuild, we thought it worthwhile to examine how the state’s solar panels fared and why solar could play an increasingly important role in resiliency efforts. In the wake of the storm, tens of millions of homes were without power. This includes solar homeowners. Solar systems automatically shut off when the grid goes down. This is done as a safety measure to protect utility workers who work to repair downed power lines. Electricity sent out by solar panels could electrocute these workers. “I had no power for five days, but had panels that had been producing,” said Christy Fellas, a solar homeowner from St. Petersburg. Her panels were installed last December. Florida law leans heavily against homeowners disconnecting from the grid. Disconnecting would enable those with solar to use the power generated by their panels, even if the grid were down. These grid rules have piqued interest in pairing solar with battery storage as a solution. Solar systems can be set up so that a certain portion of the electricity generated from the solar is fed into batteries. Solar users with battery backup can draw upon electricity from their batteries even if the grid goes down. Cost has been a barrier for wider market adoption, though increased demand for battery storage is driving down their cost. Solar and storage has wide applications beyond individual home systems. It provides a way for critical services, like hospitals and first responders, to generate and maintain electricity when disasters strike. Solar and storage have a unique advantage over traditional generation and storage methods. Gas-powered generators are reliant upon a fuel source that needs a functional supply line to be distributed. Solar’s fuel source, sunlight, does not. This is a valuable attribute when demand for fuel outstrips supply or flooded out roads block access to those in need. Going solar allows homeowners to better take control of where their electricity comes from. The addition of battery storage helps ensure that electricity stays functional when storms hit.